When death’s not the final word, it’s hard to argue. This is such a basic level of disagreement between religions and culture that it may be impossible to avoid conflict. Not that I condone it, but a couple in Oregon, members of the Followers of Christ Church, let their newborn die rather than seek medical attention, according to a Washington Post article. I have to admit that the Followers of Christ is a sect of which I’d never heard—there are thousands of such groups—but I’m guessing that at the base of their refusal to seek help was a deeply held belief in the afterlife. Almost impossible to comprehend unless you’ve accepted it profoundly yourself, this single teaching is a game changer. The child who dies, although tragic from our perspective, has not, in the eyes of a religion transcending death, lost anything. It’s sometimes difficult for us to to realize just how radical a teaching Christianity was in its early days. The myth of the martyrs may well have been overblown, but the fact is here was a sect that didn’t fear death like the vast majority of people do. Resurrection is a powerful concept. Those who truly believe in it have nothing to fear. Modern-day sects that take this seriously may respond quite differently to crises than “normal” religions. In a situation Niebuhr would’ve recognized, this “Christ against culture” outlook is never easily resolved. True believers will accept punishment on the part of secular authorities as a form of martyrdom. The fear of death on the part of the vast majority of people outweighs, I suspect, professed belief in the afterlife. Place the current political climate into the mix and the colors will become even more vivid. Extremism is the flavor of the day. Mainstream Christianity, for all of its problems, has sought a balance between accepting the benefits of medical science—the social acknowledgment that taking an infant’s life is inherently unfair and unjust—and an official belief in an afterlife. It allows for a fairly comfortable existence of accepting belief without becoming the radical threat to a materialistic society that more extreme sects represent. In a nation where no controls exist because of the power of office favors those who believe in nothing so much as themselves, and even the rhetoric of right to life becomes meaningless. Sects and violence, to go back to my roots, sleep peacefully side by side. And when awakened, the right to be conceived can’t be extended to life beyond the womb for those who believe death’s not the final word. As the world stumbles into another new year, my thoughts turn to Janus. The namesake deity of January (since the Romans gave us a winter New Year’s day), Janus is a poorly understood ancient deity. Since he is overseer of beginnings and endings of all sorts, he is often portrayed with two faces or heads — one facing forward and the other facing back. There are no attendant mythological stories to this god, although he appears to have been very important in early Roman religion. He comes to mind as I prepare to teach a course on mythology that I haven’t prepped for since Oshkosh; my brief holiday break has been spent reading classical mythology. Not only to we face a new year, but the beginning (or ending, it matters not which to Janus) of a new decade. Looking back over the muck-up made of the first decade of the twenty-first century, often because of religious extremists, I wonder what Janus sees down the road. There are many who feel optimistic about our firm bridle on technology and its ability to make our lives easier. Some of us believe that society has lost its appreciation for the classical study of the humanities and that we have lost our way because simplistic religion has seized the reigns from sensible mythology. In an age of information clutter, there is no one able to synthesize reason out of any of it. Perhaps it is the human condition. 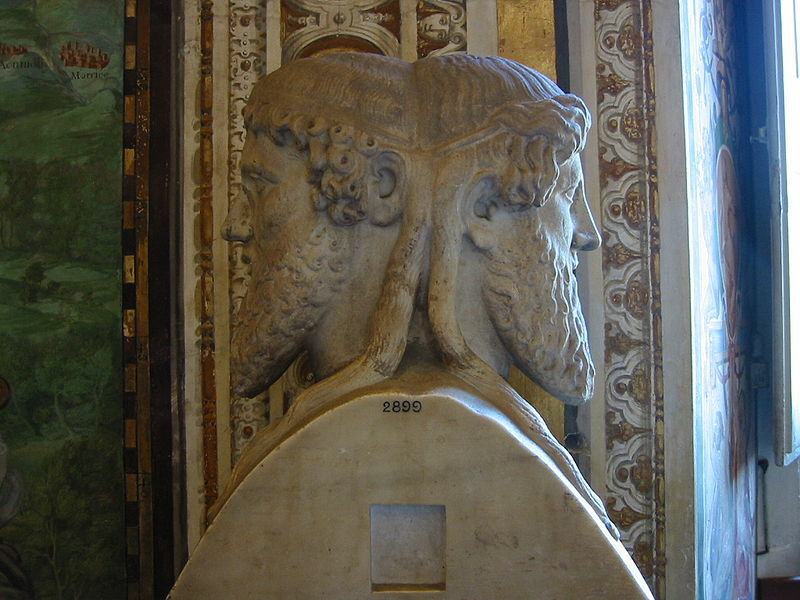 Janus likely originated in the Ancient Near East. Once he reached Rome he continued to evolve into a major deity until eclipsed by the Olympians (many of whom first appear in the Ancient Near East as well). Not ironically, religious tolerance and religious intolerance both seem to have derived from the Near East also: Cyrus the Great’s declaration of religious freedom emerged in the midst of theocidal demands on the part of jealous gods. Now as we stand on the brink of a new decade, Janus only knows which way the unfeeling pendulum will swing.